Successfully Added Car DVD Player - Detachable Panel, AV output, CD, DVD, USB, SD card playback to your Shopping Cart. High quality 1 DIN Car Audio System with anti-theft detachable panel to bring you ultimate audio entertainment on the road. 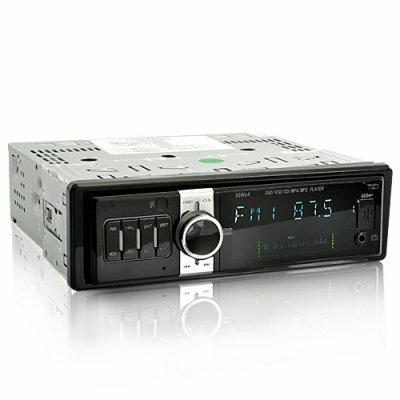 With this 1 DIN Car Audio Entertainment System, you will be getting great music from your CD collections and FM/AM radio. Furthermore, you can copy your favorite music to a USB drive or SD card and play on this audio system. Even better, with AV OUT, you can connect this 1 DIN Player to any size LCD Screen for playing DVD's. It is an easier and less expensive way to enjoy movies than buying a Car DVD Player with a screen pre-installed. This Car Audio System comes with a sleek stylish design and can be easily installed in any car with a standard one DIN slot. Plus, it comes with a detachable front panel which offers the best protection against car break-ins. When you leave your car, just eject the front panel and take it with you. In a nutshell, this is a fast and easy alternative for expensive Car DVDs to offer you equal amount of in-car entertainment. With a really affordable wholesale price, this is the perfect upgrade to any personal or company vehicles. Order one for yourself and when you find out how good it is, you can re-order more for the resale market. This model is available exclusively to our customer base, only from the leader in direct wholesale electronics, Chinavasion. AV OUT for connecting with standalone displays for viewing movies.